Wooden building blocks for kids have always been a household favourite. Jumpin' Jacks Toys offers a range of kids wooden blocks from various reputable brands that will bring out the creative strengths in any child, allowing them to build castles and towers and much more. Our superb range of wooden kids blocks not only feature a natural feel and geometric shape but also contain non-toxic paint - great for your kid's health and the environment. The simple cube takes on a new dimension of creative potential!What's unique about these colourful ..
Make way! The Block and Roll Cart from Hape will have children zooming past on their feet in no tim.. It's a stacking toy with a spin—literally!Drop the vibrant discs onto the threaded corkscrew..
With it’s cargo of number and letter blocks safely loaded onboard this wooden truck is ready to roll..
Our set of Classic Wooden Alphabet Blocks promotes creative play and stimulates learning at the same.. This brightly coloured wooden block set offers more fun by making the puzzle play mat before buildi.. These brightly coloured wooden blocks can be enjoyed by pre-schoolers as they begin to identify let.. Whether it’s a skyscraper or a fantasy castle with a little imagination the possibilities are endle.. Wooden building blocks have been a well-loved toy in many households for centuries!Not only are woo.. These colourful blocks are great for improving fine motor and problem-solving skills.Stacking them .. Build almost anything you can imagine with this 150 piece set of brightly painted pine wooden planks.. 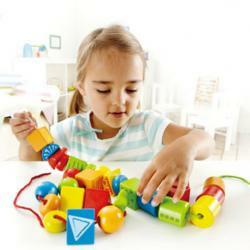 Shape sorters are classic favourites for a good reason. They teach little ones about shapes and col..